The OFFICIAL Scary-Crayon Blog! » Scary-Crayon <3s Madballs. 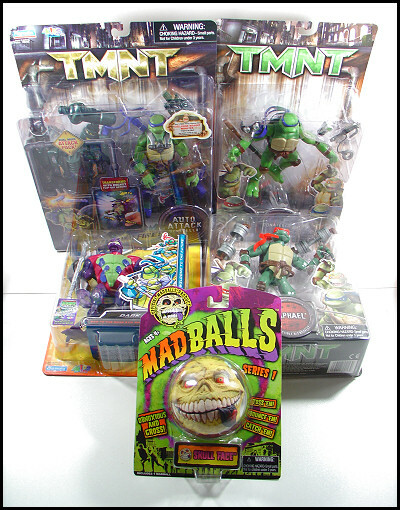 And speaking of enjoyment, this year we've sought to diversify the kiddies' delight by modifying the Donatello Christmas Tradition to include other toys -- this time a Raphael as well as a Madballs Skull Face (which explains why he stays carded in the review and is absent from the final group shot). I still need to find somewhere to drop them off -- hopefully I'll get around to that tomorrow! "them such popular playthings during the 1908s?" on the scan of the Scary Faces book, tell me, is that a sticker of a Boglin? That is indeed a sticker -- or rather a stamp -- of a Boglin! Couldn't tell you why I felt compelled to place it there way back when, but it certainly helps to distinguish the era, doesn't it? these things are even worse than they used to be. nah, I don't hate them neither am I hating them. my friend has a lot of these. I just said that they are ugly. well because they are. and that's how they are meant to be, right? that you've displayed in the photo. "nah, I don't hate them neither am I hating them." typo. I was saying I don't hate them, neither love them. That bad joke book in the old article? Well, the jokes were bad, so their mission was accomplished. Redesigned or not, I'm very glad they're back! I just hope they get around to the "super" Madballs. 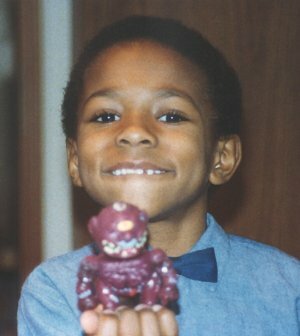 I had "Touchdown Terror" as a kid (this was before my house burnt down) and would love a chance to get one again. For some reason, your blog wouldn't let me post this under my usual name (I'm Tetsu). The new Madballs are great. I actually like Repvile too. I plan on buying them all eventually. Does anybody remember Freakballs? They were a Madball knockoff that came out about 10 years ago or so. They are actually very well designed toys. I have some and love them. Here's looking forward to Series 2 of the new Madballs!